Connection point 4-V1 pressure admitted, connection point 2-V1 vented. The working piston and the adjustment piston extend with low force and with high speed. 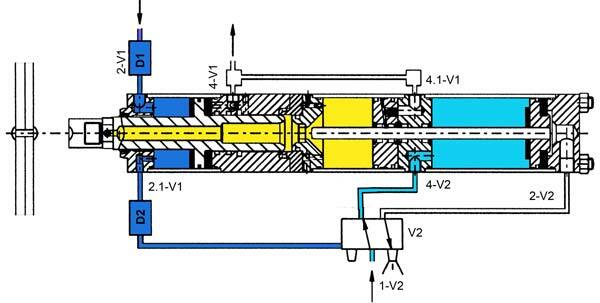 Due to the impact pressure via 2.1-V1 valve V2 is held in its initial position. Valve V1 supplied from customer, here not displayed. The working piston hits resistance and the impact pressure is released via throttle D2. Valve V2 switches over. The intensifier piston passes through the high pressure seal and divides the hydraulic connection between adjustment piston and working piston. Pressure or power intensification takes place. Compared to the intensifier piston, the working piston moves out with increased force, reduced speed, and reduced stroke length (power stroke). Connection point 2-V1 is pressure admitted. Connection point 4-V1 is vented. 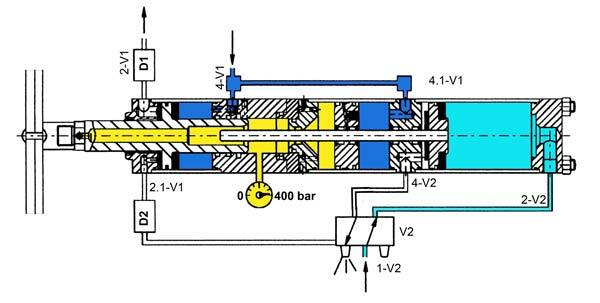 Working piston and intensifier piston move fast towards their initial position at the same time. 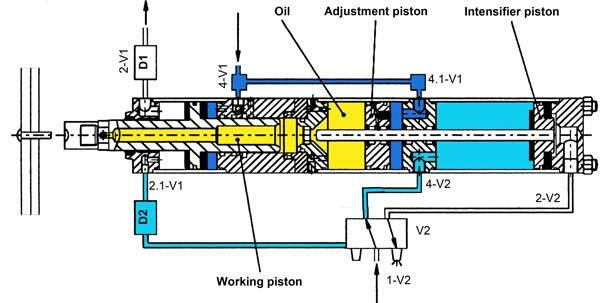 As soon as the intensifier piston opens the hydraulic connection between the working piston and the adjustment piston, the adjustment piston is oil pressure admitted and moves together with the working piston back to their initial position. 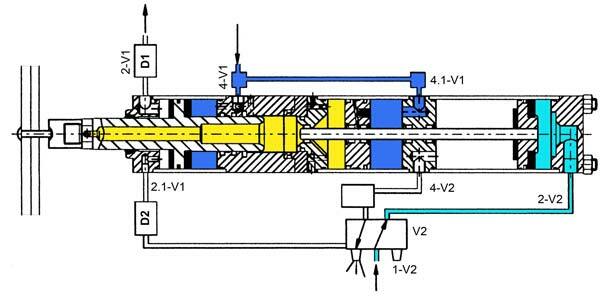 No spring inside of the cylinder which will be compressed and released during each operation cycle. Springs applied with high stroke frequencies have a limited life expectation and will destroy the cylinder when breaking. No counter force onto the intensifier piston during the power stroke. Function of the cylinder already with 2 bars. Continuous pressure onto the intensifier piston during the return stroke, pressure and speed adjustable. Highest life expectation of the cylinder. Hydraulic and pneumatic seals from leading manufacturers. Return stroke of intensifier piston achieved only with 2 bars air pressure.